I've been quite busy this month and this blog post has been in the making for over a week now. As I mentioned previously (and on Instagram), my mom is visiting, so I spend all of the past 7 days out of my home the whole day. Today I am taking a day "off" to finish uploading designs, catch up on my emails and FINALLY sit down and write that long overdue blog post. As you probably know if you have been following me for years, I take down the Christmas tree and everything Christmas related on January 1st. This leaves quite a hole in my living room and I came up with this genius "January Decor" idea. It's still festive, but minimalist and fresh. I've done the gold and glass cookie jar in the past, or the white tassel garlands. One year I even decided to permanently introduce fairy lights in my year round decor. This year, I kept with the fairy light theme, because they are awesome, festive, yet minimalist enough to blend in any decor. I am a recyclable rubbish hoarder, first because it's pretty much free craft supplies, and then because it always come in handy to have things like toilet paper rolls, boxes and glass bottles and jars to conduct a kids art class. As a result, I had quite a few big wine and whiskey bottles stashed in storage that had been screaming to be used in DIY project for ages. Beside, booze bottles really have the coolest shapes it would be a crime to throw them away. For this project, I found LED strings of lights mounted on a plastic cork so that they can be put inside any bottle. The cork also conceal the button batteries required for them to work. 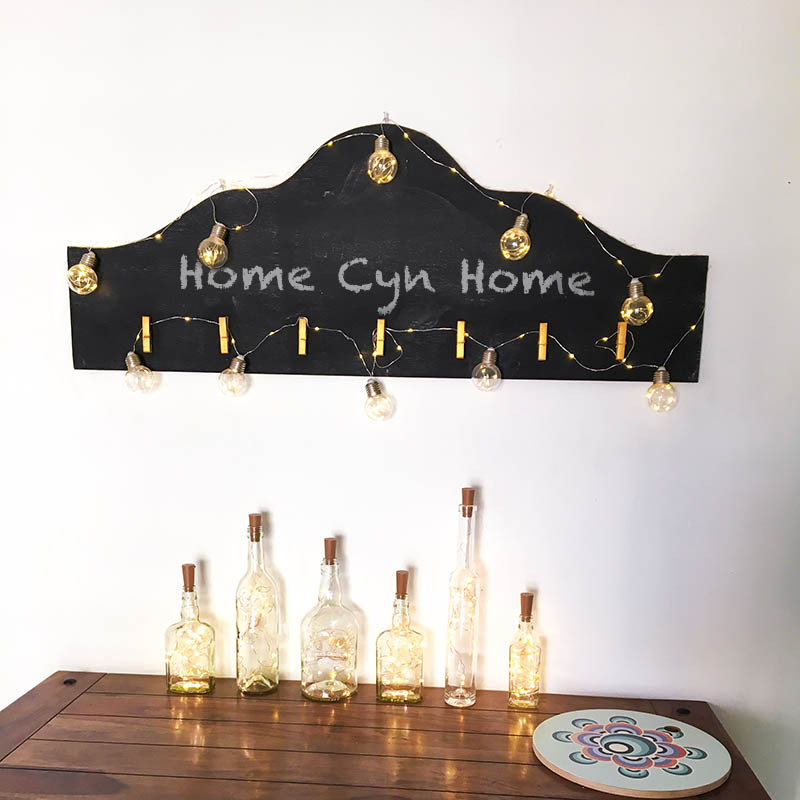 These have been one of the most awesome Amazon find in the recent past, and they have been on my wishlist for a few weeks before I decided to bring closure to 2018 and buy them to start with a fresh and happy DIY project in 2019. 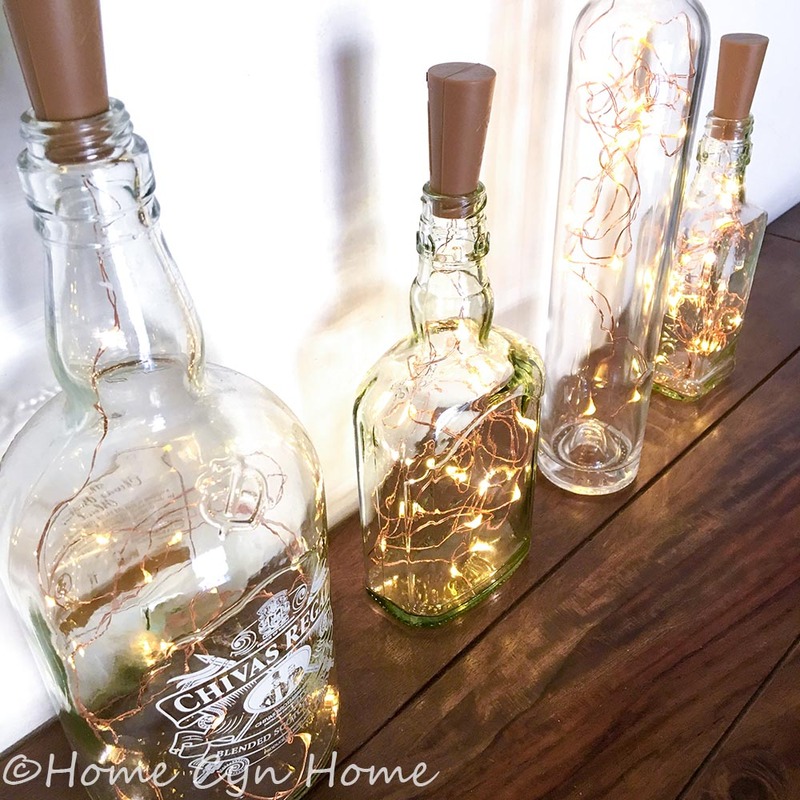 If you want to pull this decor off, start by buying these lights, they come in a pack of two, so order as many as you have bottles to use them in all at once. Then wash the bottles you want to use properly and let them dry completely before sliding a string of light in each bottle. The "cork" or rather bottle stopper is tapered and will fit on top of any regular bottle neck. To make it an interesting display, mix and match bottle sizes and shapes. For this project, I went for white glass to maintain a sense of unity, and minimalism, but if you have colored glass bottles, by all mean give it a try. The beauty of these is that you can move them around, the lights are battery operated, so you don't need to keep your light display near a plug point. I am already seeing myself moving those lights around to decorate my balconies on a Summer night, or buy more for next Diwali and spread them all around my home. So what have you all been up to all this January? Fantastic beautiful creation. I specially like the way the lights are glowing through the glass. I have been to Gujarat on a study tour in the last week of December. Got to visit Gujarat Vidyapeeth University started by Mahatama Gandhi. There the children along with their studies have to use the spinning wheel everyday to make their own clothes. They cook for the canteen and also clean the premises and look after the upkeep of the institution. The institution teaches youth different skills to make them self employed. The idea is to learn a skill along with academics. This is the gandhian way of life. This is what we are missing in our modern education system, the connect with our roots and empathy with common people. It is a different way of life. Also, got to see the Statue of Unity the tallest statue of the world, dedicated to to Sardar Patel. This along with great gujrati food and monuments made the visit memorable. If you permit, I want to send some pics to you.